Will California Buy a Used CEO this Election Year? | Paul's Voyage of Discovery & Etc. ← Rockmes @ SPACE: Making the Kids Jump! Will California Buy a Used CEO this Election Year? How is it possible that in a post-Enron, post-Lehman Brothers, post-Wall Street Derivatives & Mortgage Meltdown, post-British Petroleum/Haliburton Oil Spill world – that Californians could consider handing the state’s highest offices to a couple of people whose claim to fame is that they were corporate CEOs? 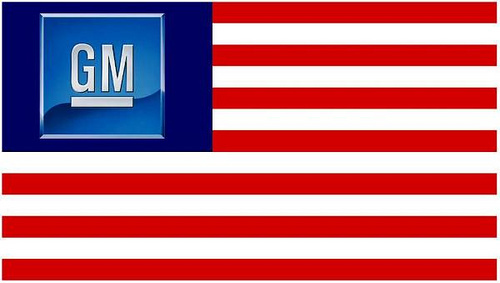 Aren’t we well beyond false notions that “What’s Good for General Motors is good for the country”? 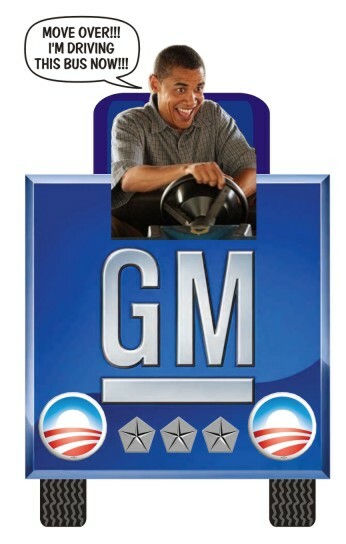 Hell, what was good for General Motors wasn’t even good for General Motors! 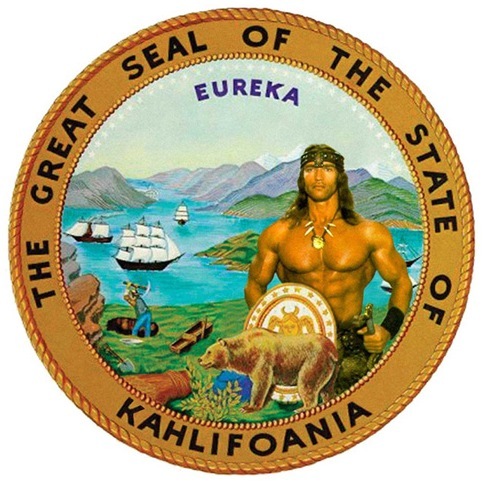 The elections in California this fall for Governor and U.S. Senator will test the appetite of the body politic for that old GOP/Chamber of Commerce pabulum that government works best if it is run like a business. Will working class voters still buy that snake oil from millionaires masquerading as populists? Does anyone really believe they want their government run like a business – when the primary purpose of a business is to make a profit? Protecting all of our citizens from crime, fires, unsafe drinking water, and providing us all with parks, roads, garbage removal, and a judicial system – none of that will ever turn a monetary profit. Our profit from the exercise of good government is a better life for everyone. 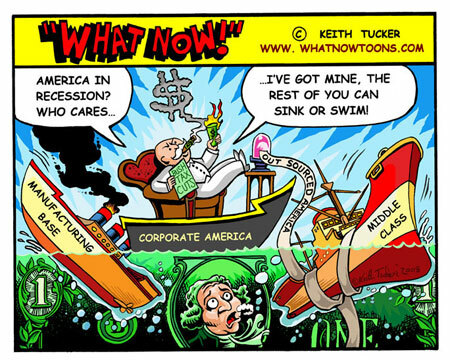 What have the corporate CEOs of the 21st century shown us so far in the first decade of the New Millennium about their concern for the welfare of average Americans struggling to stay afloat? How have they demonstrated their concern for the commons? 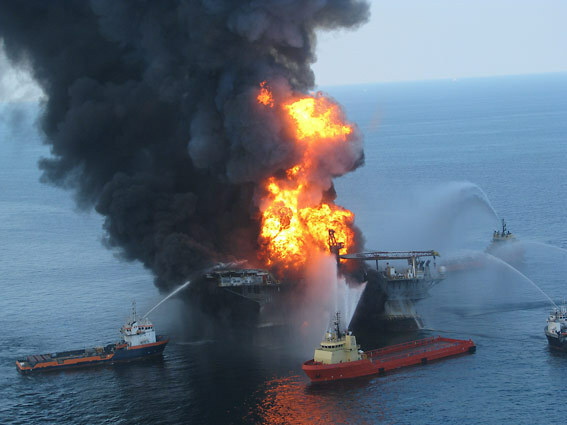 How have they acted as stewards of the environment they exploit for profit? 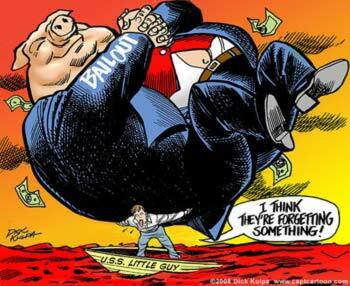 The answer to these critical questions can be found in jacked-up credit cards rates, skyrocketing insurance premiums, continued pollution of the environment, turning banks into Wall Street gambling casinos making bad bets with our money – and, of course, corporate bailouts paid by taxpayers. All the while, the CEOs that run these under-regulated rackets rake in mega-millions – taxed at a lower rate than the average fireman, cop, or teacher. E-Bay CEO Meg Whitman and former Hewlett Packard CEO Carly Fiorina are cut from the same bolt as the rest of our modern corporate robber barons. And now, after having lined their pockets in the Great Post-Reagan Corporate Cash Grab, they think that a bit of faux feminism and tough but tired talk about balanced budgets and “runaway” spending will convince voters to put two foxes in charge of the henhouse. The U.S. Senate race pits Senator Barbara Boxer against her likely adversary, Carly Fiorina. Sure, Fiorina looks good, sounds good, and talks tough – but she’s the worst kind of predatory corporate animal. And like so many corporate CEOs whose successful image does not match up with their actual performance on the job, Carly hopes to “fail up”. And, if California voters don’t take a close look at her history, she might even get away with it. 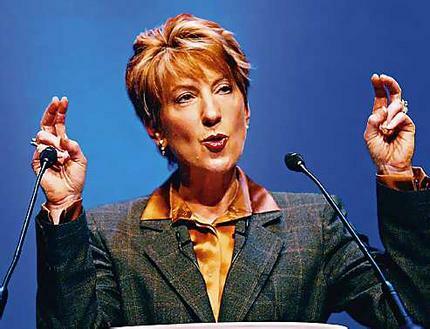 After the Hewlett-Packard board forced Fiorina to resign in the wake of a contentious merger with Compaq and falling stock prices, Infoworld put Fiorina on their 2008 list of products and ideas that were flops, calling her the “anti-Steve Jobs” for losing the goodwill of American engineers and alienating HP’s existing customers. 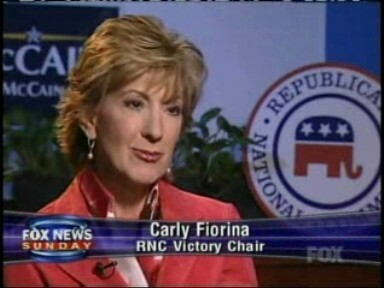 In April 2009, the business web site Conde Nast Portfolio named Fiorina to their rotten roster of “The 20 Worst American CEOs of All Time” for her failed HP-Compaq merger and the sad but salient fact that HP stock lost half its value during her tenure. Of course, when they booted Fiorina out, the HP board softened Carly’s fall with a golden parachute worth more than twenty million dollars. How’s that for fiscal conservatism?But you can be sure she’ll be an aggressive penny-pincher when it comes to pensions for public employees. For corporatists like Fiorina, public sector spending is always “wasteful” and “bloated”. Besides, Carly is the queen of off-shoring jobs. Maybe she can have our California road system — and all those nasty potholes — fixed by low-paid phone-bank employees in India? 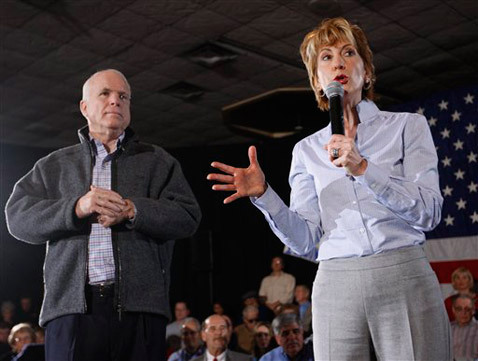 And if that’s not enough, Ms. Fiorina was the top economic advisor to GOP presidential candidate John “the fundamentals of our economy are sound” McCain. Oh yeah, and moments later, our “sound” economy crashed and burned like The Hindenburg. 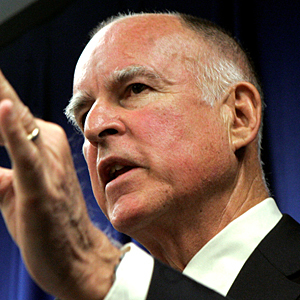 The race for Governor will be a contest between Meg Whitman (and her mega-million dollar campaign war chest) versus that old Democratic stalwart, Jerry Brown. 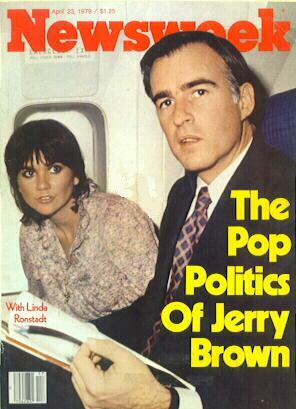 It’s frightening that the Democratic Party couldn’t find a sexier, more contemporary, inspiring, and charismatic candidate that Jerry Governor Moonbeam” Brown. But progressives can’t let their lack of enthusiasm for a retread like Brown lesson our zeal to keep Whitman out of the Governor’s mansion. Meg Whitman is a carefully packaged product, rolled out in a glitzy multi-million dollar promotional campaign – but voters should reject her like New Coke. This ersatz woman of the people, has an annual salary of $2.19 million — but her eBay stock ownership has probably made her the first female billionaire created in the Internet age. Of course, we don’t really know ho much money Meg has. We can guess, however, that given the zillions she’s spent on TV ads so far, she probably is a billionaire. Great. Just what we need in California: a billionaire CEO deciding that we’re “wasting” too much money on public education, public parks, public heath, and all those pesky environmental and workplace safety standards that “drive business away”. 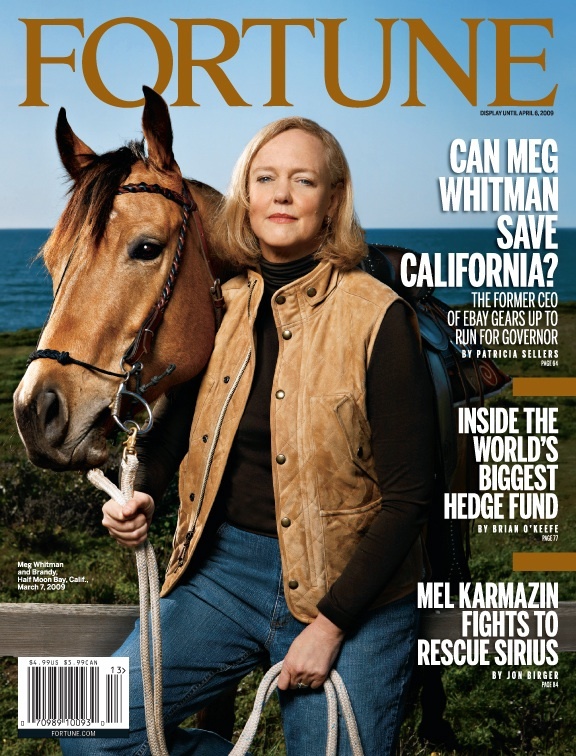 Given her corporate-friendly priorities, no doubt Meg would help California win the national race to the bottom. Whitman graduated from Princeton in 1977 and went on to Harvard, where she earned a master’s degree in business administration. But she still manages to join her GOP brethren, like the cranky old guy she’s smooching in the picture below) in casting progressives as “elites” who are out of touch with mainstream America. 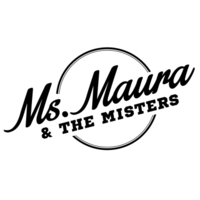 Whitman worked her wa up the corporate ladder, from Procter & Gamble, to Stride Rite, Florists Transworld Delivery (FTD), and Hasbro, where she successfully re-launched the vintage toy, Mr. Potato Head. 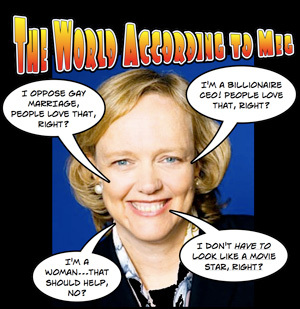 Of course, it was Meg Whitman’s success at eBay that earned her fortune and fame. 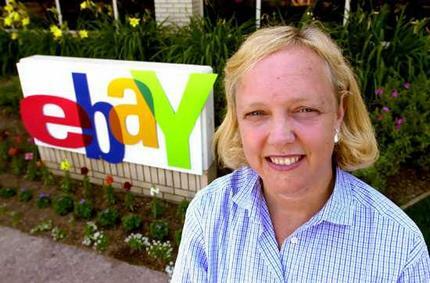 She oversaw eBay’s initial public offering of stock in ‘98 and helped eBay become a great success. That’s true. And after making corporate history by helping to promote and expand this revolutionary new way for people get rid of things they don’t want by selling them to others – she’s hoping sell herself to California voters. But Meg Whitman is something we don’t want. GOP fiscal policy is founded on one thing: what’s good for corporate America is good for the country. Whitman buys into that because she’s a thoroughly corporate creature. She didn’t devote herself to public service: she made money. She turned a profit. Government was something that often got in her way. Don’t be fooled, California. Republicans and Corporate CEOs don’t give a damn about average working Americans, and progressive, egalitarian values are anathema to them. Ignore the flags and the ads. We don’t need the GOP-CEO mentality in the Senate or the Governor’s mansion. We need leaders who put people above profits. 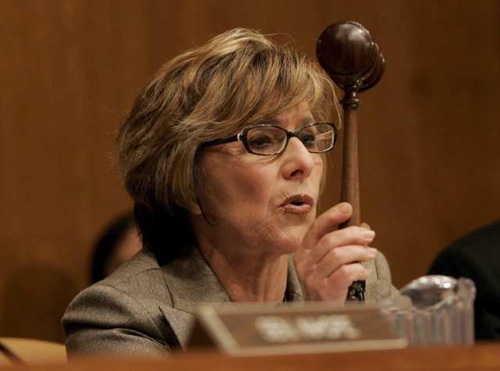 Barbara Boxer and Jerry Brown have proven their commitment to putting people first. They may not be the flashiest product on the shelves this year, but they’re reliable. Shop wisely this election year. And if the Republicans can’t sell Meg Whitman and Carly Fiorina to California voters this year — they can always put Meg and Carly up for sale on eBay. Just ask Meg: it’s a great way to get rid of stuff you don’t want. Carly should be disqualified for that bizarre sheep ad alone. And her tag line of “It’s Carlyfornia”. And if Meg really wanted to help the state of CA, she could have plugged vast budget holes with what she’s PERSONALLY spent on her campaign – I think $49 mil at last count. These are terrifying times, and the electorate is unpredictable. But I hope people will come to their senses and neither of these women wind up in office. California, already in dire straits, will never recover from their conservative corporate leadership that brings profit to the few while gleefully screwing the majority. You are so right, Sal! The welfare of our beautiful, magnificent, adopted state hangs in the balance! Damn! Lucky we aren’t Louisiana!